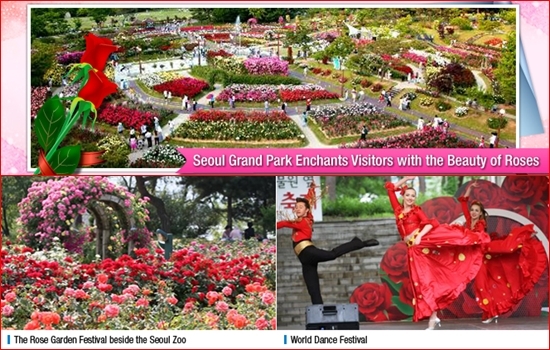 Seoul Grand Park is holding its festival of festivals, the Rose Festival, from Friday May 25 to Sunday July 1, 2012 at its Theme Garden, which is located right beside the Seoul Zoo. Korea’s largest rose festival kicks off at the same time the park begins to open until 10PM every night. Celebrating its tenth anniversary this year, the “Rose Garden Festival at Seoul Grand Park” is being held in the Rose Garden, which covers about 66,000 m2 and boasts 300 varieties of roses including the Golden Monica Rose, Queen Elisabeth Rose and Maria Callas Rose. Visitors to the festival can also enjoy the Flower Rainbow Garden, which is now full of poppies and a great variety of other wild flowers covering about 16,500m2. Of all the phenomenally beautiful roses in the Rose Garden, the ‘magic roses,’ whose colors change depending on the temperature, are a real rarity and extremely popular among young couples who come to declare their love to each other. Alongside the Flower Rainbow Garden and its irresistibly captivating poppies, various specially-prepared European-style attractions including a windmill, gazebo facility, herb garden and flower tower are sure to fascinate visitors to the festival. Furthermore, various exotic international dance performances, exciting events and educational hands-on experiences will also be staged in collaboration with the Seoul Zoo over an area of 33,000 m2. Indeed, one of the highlights of this year’s Rose Festival is the World Dance Festival, which will feature a diversity of world dances performed by overseas dance troupes, including the Cancan (France), Flamenco (Spain), Butterfly (Bulgaria), Mambo (Cuba), Samba (Brazil), Tango (Argentina) and Hula (Hawaii). The performances will be held at 14:30 and 18:30 on weekdays, and at 15:30, 18:00 and 19:30 on weekends and holidays. From Korea, the world-renowned non-verbal performance troupe known as Nanta and a B-boy (breakdancing) group will stage a joint Fusion Concert, ROSES&LOVE, composed of hip-hop, tap dance and beat-box styles, among the many thrilling performances. Visitors will also be given opportunities to participate in the performances while learning to play a whole lot of objects. The performance begins at 15:00 and 17:30 on weekends and holidays. As the best way to record memorable moments consists in taking photos, the park has organized a host of exciting photography programs including a photography competition. Visitors can take pictures in the House of Roses (a photo zone), have them printed at a separate photo-printing demonstration event, and then submit the hard copies to the competition headquarters. Any pictures that receive awards at the competition may eventually be displayed in the park. When it comes to photography, everything is possible during this festival. A number of hands-on experience programs are available at the Experience Zone in the Rose Garden during the festival, including face painting using rose patterns and making a variety of everyday items such as natural rose soap, fans, necklace straps for cell phones and pinwheels using roses. These programs are only available at weekends and holidays between 10:00 and 18:00.